2019 marks a milestone in my life in Spain: 30 years. This year is my pearl anniversary of living permanently in Spain. That nice round number – 3 decades – lends itself to reflection so part of my blog this year will feature a series of posts celebrating my 30 years in Spain. 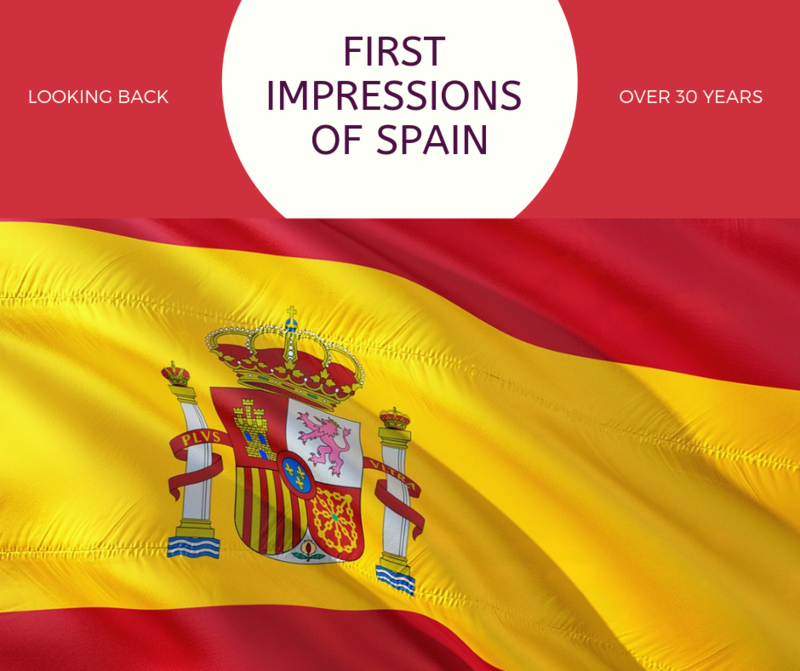 In the series, I’ll be looking back on my first impressions of Spain. I’ll be reflecting on what I love about my adopted country and what I hate. Deciding how Spanish I feel after 30 years. Looking at how I came to end up in Malaga in Andalusia. And lastly, find out what I have yet to discover about this wonderful country. In this first post, I go back to the beginning and look at my first brushes with Spain. My first encounters with its people, landscape and culture. And how they ultimately all came together and persuaded me at 24 that this was where I wanted to make my home. When I was a child and a teen, Spain was very much a minor player. France and Germany took centre stage as 2 of my O level subjects and France was always the perennial exchange destination. Scraps of Spanish culture made micro-appearances – fragments from Bizet’s Carmen, all the lyrics from “Little White Bull” on SP vinyl on the portable record player as a very young kid. A place my Mum occasionally reminisced about, specifically Lloret del Mar that she had visited in the very early 60s. Sunshine. Heat. Pedro? Juan? And vague references to a dictatorship that my grandfather tutted and muttered over. Then fast-forward to 1981 and the footage on the BBC evening news of a wild-looking man in an extraordinary 3-cornered hat firing shots into the ceiling of the Spanish parliament. “Poor Spain,” said both my parents. This was also the year that a Spanish family from Madrid arrived to learn English. Beautifully turned out and impossibly elegant for rural Northamptonshire in the incipient 80s. They dealt in antiques – more elegance and glamour – and had plenty of money. Their cousin, my age, stayed with us and practised her word-perfect English. Taught us how to make Spanish omelette with horrifying amounts of cooking oil and then invited me and my next sister down to Santander. First time on a plane and first time further than central France. My sister and I arrived in northern Spain for 2 weeks without speaking one word of the language. We found ourselves swept up in a world of brilliant sunshine, intense heat – yes, we both got sunstroke – alien food and a large family who welcomed us with open arms. 2 weeks of not really getting what was going on. Sitting crammed into the informal living room with the entire family watching Lady Di marry Prince Charles as everyone exclaimed “¡Qué guapa, qué guapa!” More brilliant sunshine. Soldiers outside the Bank of Spain with sub machine guns – yes, we were so scared we almost couldn’t walk past. “Why do they want a dictator back?”, we asked ourselves. When we asked our host, she shrugged and said, “Because he was so much better”. Then it was our turn to shrug. Did I like Spain? Probably not too much. It felt alien and a world apart from England and everything I knew. But nevertheless, I went back to school in September and chose Spanish as 1 of my A level subjects. That changed everything and probably explains why I’m here 38 years later. My Spanish teacher was young, hip and trendy. She was also madly in love with Spain and all things Spanish. Her classes oozed passion and fire – you could have shouted an ¡Olé! at the end of every single one. And then in the upper VIth, she invited all of us round to her (trendy) flat for a Spanish evening. Garlic soup, meatballs, Spanish omelette, a plonky tinto and Serrat putting Antonio Machado to music. I too had fallen in love. And then to uni where Spanish became half my degree and my next impressions of Spain. I spent a summer coaching English to a Spanish family from A Coruña as we travelled round Portugal and Spain. In an ancient car towing a rather precarious caravan. Again, that brilliant sunshine and intense heat. The vision of the monstrous cross on the Valle de los Caídos as dusk fell on the train chugging its way from Madrid to Galicia. Meeting a family whose mother spent long, long days in the dark with migraines and whose father spent long, long hours attempting to correct his short-sightedness with eye exercises. They obviously didn’t work since he later crashed through the toll-road barrier near Madrid. And in true Spanish style, we just drove on. Discovering that you also go to the beach in the rain in Galicia. That the icons of tourism in Madrid were the Corte Inglés and the chance to go to a Chinese restaurant. That if you picnic for lunch by the side of the road in deepest Castille you need a tablecloth and 3-course meal. That paella cooked on an open fire in the pine forests in Guadaljara tastes the best it ever will. That I was right to fall in love with Spain. Many years later after those first impressions of Spain, the love affair continues. Like all couples, we’ve had our ups and downs. Our tiffs and reconciliations. But on balance and after 30 years, we make a great pair. Who would have thought that an English girl from London who knew all the words to “Little White Bull” at 5 would end up calling Spain home? But I did and I do. And in case you too want to learn those lyrics, here’s Tommy Steele himself!